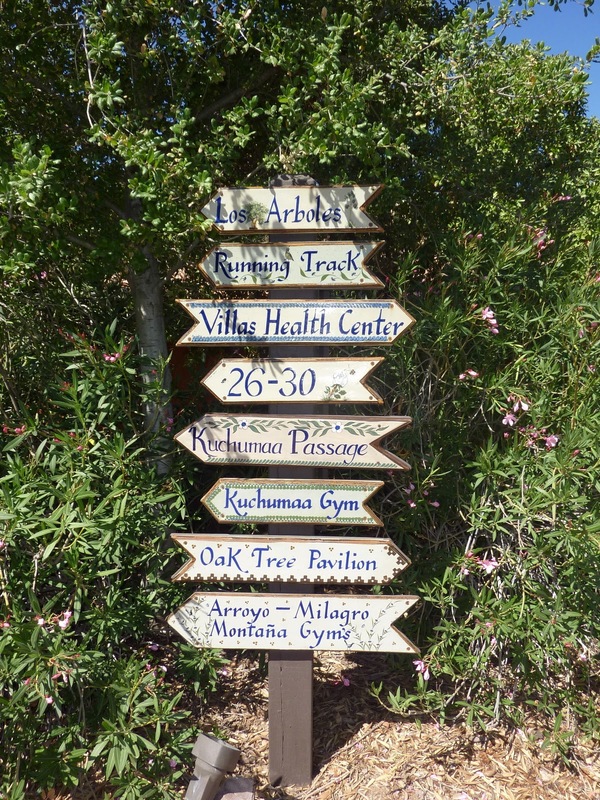 I went to Rancho La Puerta, the legendary wellness retreat and spa in Tecate, Mexico, to whip myself into shape and get healthy and centered. Certainly those goals seemed ambitious enough for one week. What happened instead was quite unexpected; I discovered a series of classes and activities that allowed me to focus on alleviating the back pain that’s plagued me for years. And through Rancho La Puerta‘s gifted teachers, I learned of cutting-edge new treatments that have allowed me, for the first time, to imagine a life free from pain. 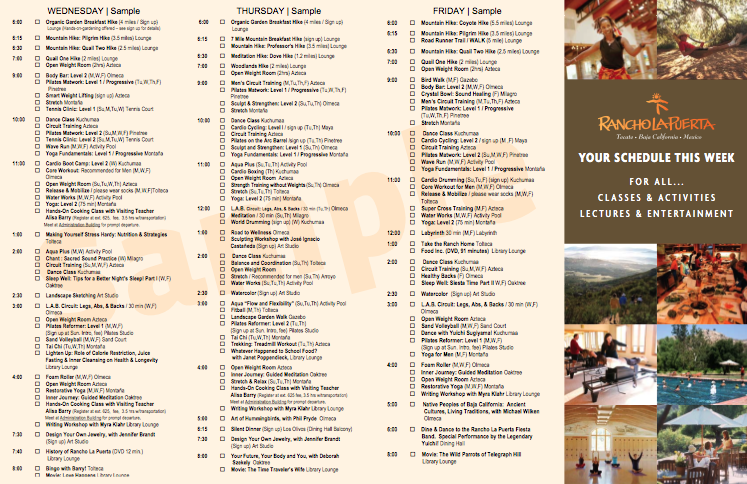 When you arrive at the San Diego airport, before you even board the bus for the Ranch, a representative meets you and hands you a welcome packet that includes a list of the classes offered that week. 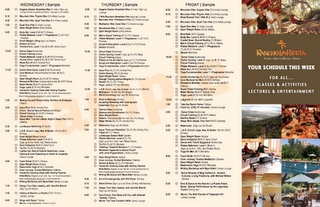 You also get a handy dandy weekly calendar that you fill out with all the offerings that appeal to you. There are so many tantalizing options that the only problem is finding time for everything you want to do. All week long at the ranch, you see people walking around, calendar in hand, scribbling out one choice and pencilling in others as they hear about more and more things they’d like to try. With an hour to spare before the bus departed, I sat down and scanned the list. Imagine my surprise when, in addition to the yoga, pilates, meditation, and dance classes I’d expected to prioritize, I saw classes like Posture Therapy, Feldenkrais, Release and Mobilize, Foam Roller, and Back Care. I immediately penciled them all in, starring each entry. After all, six years of doctors’ visits, physical therapy, chiropractic treatments, and acupuncture had gotten me nowhere. Why not take advantage of these unexpected resources? Once at the Ranch, I discovered another unexpected resource. At my very first posture therapy class, who should I meet but other back pain sufferers. I don’t know why this was a surprise; after all, who else would eschew ballroom dance, hula hoop, and water aerobics for something as un-exciting as posture therapy? But the unexpected gift of a community of people also in pursuit of pain relief proved an incredible boon. After class, we all eagerly compared notes, and throughout the week, as we all turned up regularly at each class with a spinal therapy component, we got to know each other better, pelting each other with tips, suggestions, and supportive comments. But the real resource was the teachers themselves, particularly biomechanics expert Nathan Briner, who taught the posture therapy, release and mobilize, and foam roller classes in addition to the yoga level 2 classes most of us also joined. A true fanatic for pain relief and freedom of movement, Nathan runs True Balance Dynamics in San Diego in addition to teaching at Rancho La Puerta. I was so astonished at the gains in mobility and flexibility, as well as the pure and simple pain relief I obtained from Nathan’s classes that I scheduled a one-on-one session with him to learn more about the multi-faceted approach he advocates for relief of back, neck, shoulder, knee and hip pain. Nathan’s philosophy is that pain is merely a signal that our bodies are protecting an injured area by tightening up the muscles that surround it. However, while traditional physical therapy focuses on stretching the affected muscles to relax them, Nathan believes this brings only temporary relief. Instead, he takes the opposite tack, working tostrengthen the affected muscles by targeting them with special exercises and stimulation techniques that rebuild the signals between the muscles and the central nervous system. During our session, Nathan was generous in introducing me to a wealth of groundbreaking neuromuscular therapies, none of which I’d heard of before, and all of which I found spectacularly helpful and am continuing to pursue with the help of his referrals. • Muscle Activation Technique – A form of neuromuscular therapy invented by Colorado-based athletic trainer Greg Roskopf, MAT is starting to be recommended by many orthopedic surgeons who’ve seen it heal injuries they expected to require surgery. • Primal Reflex Release Technique – a variation on MAT, PRRT has “taken MAT into a new paradigm,” as Nathan puts it, allowing faster results. • Pain Neutralization Technique – pioneered by chiropractor Stephen Kaufman and also called the Kaufman Technique, this trigger point technique stimulates neurological reflexes. In addition to these, Nathan’s therapeutic method includes take-home postural strength training that incorporates the biomechanics resistance therapies taught by sports therapist Tom Purvis in his Resistance Training Specialist training program. The week after Thanksgiving, Briner will be leading a special week of classes at Rancho La Puerta, Powerful Posture, with an extended schedule that features all of his posture therapy and back pain techniques. If you suffer from back pain, I can’t recommend this program highly enough. You could be giving yourself a gift of flexibility, pain relief, and mobility that will last the rest of your life.